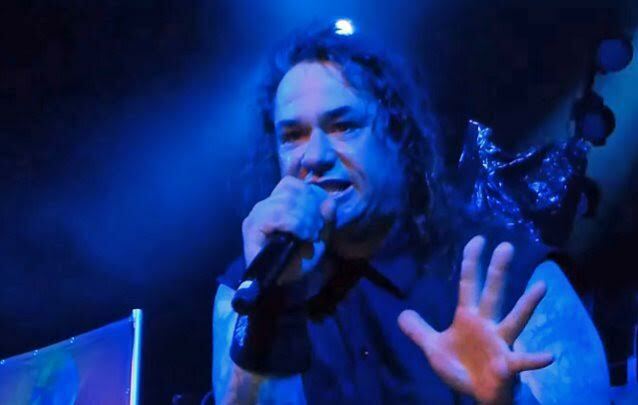 Howie D. of National Rock Review recently conducted an interview with vocalist Steve "Zetro" Souza of San Francisco Bay Area thrash metal veterans EXODUS. You can now listen to the chat using the audio player below. A couple of excerpts follow (transcribed by BLABBERMOUTH.NET). Zetro: "It's been two years. Time flies, and I'm not going anywhere. Gary [Holt, EXODUS and SLAYER guitarist] is out with SLAYER, and he's been busy with SLAYER, actually, since 'Repentless' came out. And we wish him all the luck; we love SLAYER. But everybody knows: Gary is EXODUS. And we all talked about a new record. I'm not gonna sit around. We're gonna put a new record out. And I would say in 2017, probably around the same time — early fall — that you're gonna get that. Because it's gonna be three years, and it's time. It is. We've toured the world over and over, and we've actually discussed it. It's time to start putting some stuff together. And I know Gary knows that, and I know he's excited to do it, 'cause him and I have actually had a conversation about it. So, again, the fans have got nothing to worry about. We're not gonna try to milk this one for five or six years. I've committed full time back to EXODUS, and this is where I'll be for the duration. That's another thing you won't have to worry about. Me and the band get along great, and it's a lot different now. Everybody's high on going out on stage and rocking and making sure our performance is what it is. So if you've seen EXODUS in the last two years, I can tell you, you've gotten your money's worth, 'cause we go out there and give it our all. And I love it and I'm having fun. We ain't going anywhere, brother." Zetro: "I think when you get the opportunity to… always do things like that; always go home, I guess you'd say. I've always mentioned that that you can always go home. And it's great. And if you look back at all the acts that you can think of through the history that had member changes, especially vocalist member changes , and I can think of… When [Rob] Halford wasn't in PRIEST… Now, I love Ripper, and Tim Owens did a damn good job. 'Jugulator' is a great record — really heavy — but he wasn't Rob. And I'll even say Blaze Bayley's records with IRON MAIDEN were really heavy, and it showed a really heavy side of IRON MAIDEN, but he's not Bruce [Dickinson]. So I can understand the mentality of, 'Man, this was the guy that I liked when the band was being born, when they were first coming up.' So the original guy, I can always relate to that. And so, when I came back, especially this time, I wasn't gonna take any part of the business for granted — not radio interviews, not fans, not the music, not my live show… not anything that goes into it. I was gonna give it a hundred percent, and I've given it probably a thousand percent. I'm very well into EXODUS. Fans as well… They are the biggest part of this. Metal doesn't survive without them, and we would never be 31 years here if we didn't have them."